Islamabad: US President Donald Trump has written to Prime Minister Imran Khan, seeking Pakistan's support in bringing the Taliban to the negotiating table to end the 17-year brutal war in trouble-torn Afghanistan, officials here said on Monday. 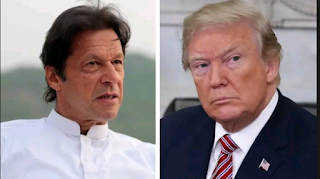 The development came weeks after Trump said Pakistan does not do "a damn thing" for the US, alleging that Islamabad had helped al-Qaeda chief Osama bin Laden hide near its garrison city of Abbottabad. The Foreign Office (FO) said that the President, in a letter, has sought Pakistan's cooperation in bringing the Taliban to negotiating table. In the letter, Trump "stated that his most important regional priority was achieving a negotiated settlement of the Afghan war. In this regard, he has sought Pakistan's support and facilitation," the Foreign Office said. The President also acknowledged that the war had cost both the US and Pakistan, and emphasised that both the countries "should explore opportunities to work together and renew partnership". Pakistan welcomes the decision to explore ways for a political settlement of the Afghan issue, the FO said. "Since Pakistan has always advocated a political settlement to end the war in Afghanistan, US decision is welcomed," it said. Pakistan also reiterated its commitment to play a facilitation role in good faith, stressing that peace and stability in Afghanistan was a shared responsibility. Last month, the Pentagon said that the US has suspended USD 1.66 billion in security assistance to Pakistan after President Trump's directive. Ties between the US and Pakistan strained after Trump, while announcing his Afghanistan and South Asia policy in August last year, hit out at Pakistan for providing safe havens to "agents of chaos" that kill Americans in Afghanistan and warned Islamabad that it has "much to lose" by harbouring terrorists. The Trump administration, in the recent months, has intensified its efforts to seek a negotiated settlement of America's longest war in Afghanistan where the US has lost over 2,400 soldiers since late 2001, when it invaded the country after the 9/11 terror attacks.